Move ’N Groove Kids gives kids plenty of opportunity to dance and jump around - just what they love doing best! Buy all three volumes for the price of two. Move ’N Groove Kids Vol. 1, Go to the Zoo, and Go to the Park. Join Deb, Munki and the Move ’N Groove Kids as they embark on a new adventure at the zoo. Follow along as they learn their animal A B C s, make new friends and rescue Munki when he gets into trouble. 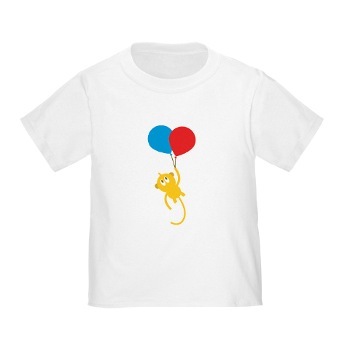 The Munki Balloon T-Shirt is 100% Cotton. Get the Move ‘N Groove Kids T-Shirt for your child or as a gift. Wear it whenever it’s time to Move ‘N Groove, be it at the park, at the zoo, or at home with Munki. Check out our apparel store at CafePress. Join Deb, Munki and the Move ’N Groove Kids as they embark on a new adventure at the park. Follow along as they ride bikes, throw frisbees and rescue Munki when he gets into trouble. 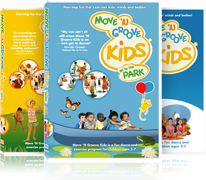 Move ’N Groove Kids is a creative movement and exercise program for children ages 2 to 7 years. The Move ’N Groove Kids video program features live-action, classroom-style learning with entertaining text and character animations that no child can resist!